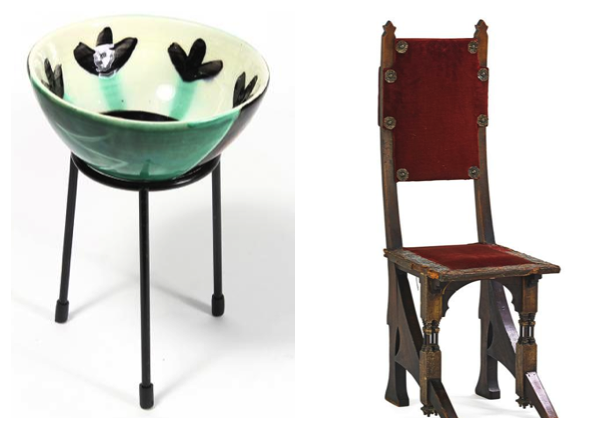 Things will get plenty busy for the Rago Arts and Auction Center this weekend when it holds its sale of Early 20th Century Decorative Arts and Modern Design. It’s enough to make the mouth water of every interior design junkie from here to Honolulu! Nearly a thousand original pieces up for grabs, many from the biggest names in the industry, all available to the bidder who bids boldest. Part of a new series dealing with mid-priced 20th Century furniture and decorative objects, the Mid-Mod kicks off Friday with 286 lots featuring pieces from industry icons such as Vladimir Kagan, Edward Wormley, Karl Springer, Charles & Ray Eames, Frank Lloyd Wright and more. 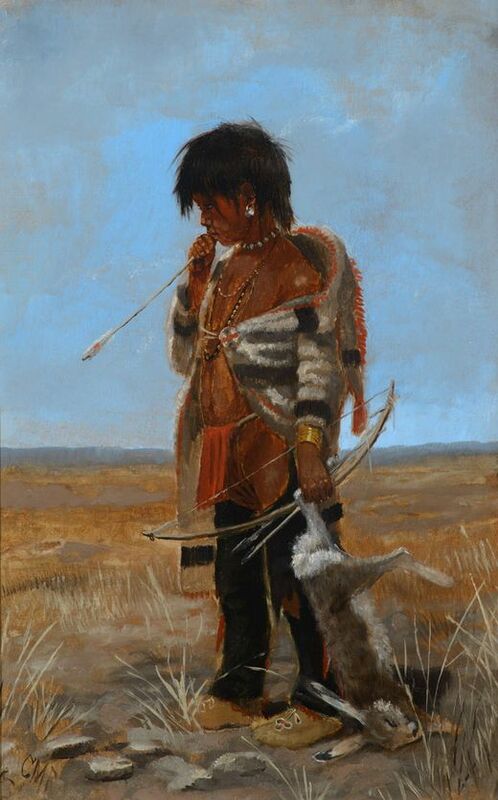 The Kagan piece (above), Lot 601, is a real eye catcher! Kagan, the German born son of a master Russian cabinetmaker, revolutionized home furnishing design in 1950 with the introduction of the Serpentine Cloud sofa. Here, Rago auctions off an edition Kagan designed for Directional in the 1960s. With an estimated value of $4 to $6K, it’s a piece sure to attract plenty of attention. The catalogue features works from arts and crafts masters to contemporary American and European artists. There’s ceramics by Newcomb College, Grueby, Teco, Tiffany Studios, plus a pink volcanic vase by George Ohr. There’s also the ceramics collection of Allen Hendershott Eaton, and a fine group of Fulper from the Collection of Robert A. Ellison. 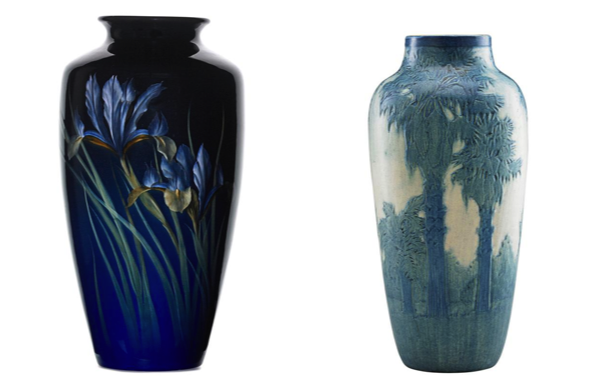 One star lot in the sale is the spectacular Rookwood Black Iris vase. Designed by Carl Schmidt, who worked for Rosewood from 1896 to 1927, this piece features a gorgeous Iris glaze and is similar to another Rosewood that sits in the Newark Museum. 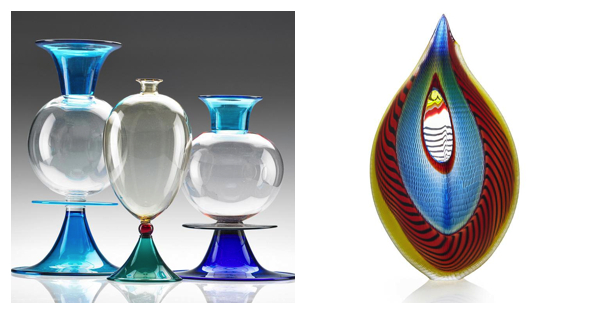 There’s an exceptional grouping of contemporary glass up for grabs in this sale. Three spectacular sculptural vessels by Murano maestro Lino Tagliapietra being offered by a private collection in Chicago, plus a half dozen of the finest pieces by Japanese artist Yoichi Ohira. This will be complemented perfectly by strong examples of works from Italy, the United States, and Czechoslovakia. Along with many great pieces designed and made by important American craft figures, Sunday’s Modern Design auction features a strong European representation. Furniture by Pierre Jeanneret, Carlo Bugatti, Gio Ponti and Ico & Luisa Parisi, will be offered alongside wares designed by Hans Wegner, Finn Juhl, Arne Jacobsen, and Flemming Lassen. A strong catalogue of ceramics, wall hangings and sculpture will also be on offer. Speaking of ceramics, Lot 2405 is certainly worth a look. A bowl designed in 1958 by Pablo Picasso, one of the most iconic artistic figures of the 20th Century, it is painted, glazed and signed on its base. This is a beautiful piece, the perfect way to add a Picasso to you collection. Rago Arts and Auction Center is located in Lambertville, roughly midway between New York City and Philadelphia. Get directions online at www.ragoarts.com.